I think I have previously mentioned that last year I worked and lived in London while I was doing a 12 month undergraduate placement. The process in getting a job was really tough, and it’s different to any other job application (except graduate schemes). It was only through many, many applications that I learned the process. Therefore I applied for a job at my university to be a placement advisor to this year’s candidates, as there was no help when I was doing it, and if I can save one person struggling, then sign me up! In one of my open door sessions, someone asked me to review over their CV, which I pointed out some basic, but potentially rejection inducing errors. Later I had another person with similar silly things on their CV. This got me thinking about where we learn how to write CVs. I went to dozens of workshops to learn, but I guess not everyone does. For jobs like placements and graduate schemes, companies are literally receiving hundreds if not thousands in the case of multi billion pound corporations, of applicants per role. HR need a way to sift through the mass, so it is a case of quick scanning through CVs. If there’s a silly mistake, then they just throw it away- honest, I’ve got many friends in graduate recruitment. Now, I don’t claim to be an expert in CVs, but I’d like to think I’ve picked up a thing or two, so here’s a small guide to help you polish off your CV and get the job you deserve! This is the layout that I was taught, and so far has proven successful for me. Please note, this is not my actual CV, just an example one I quickly wrote for reference... as if I got A in Maths! 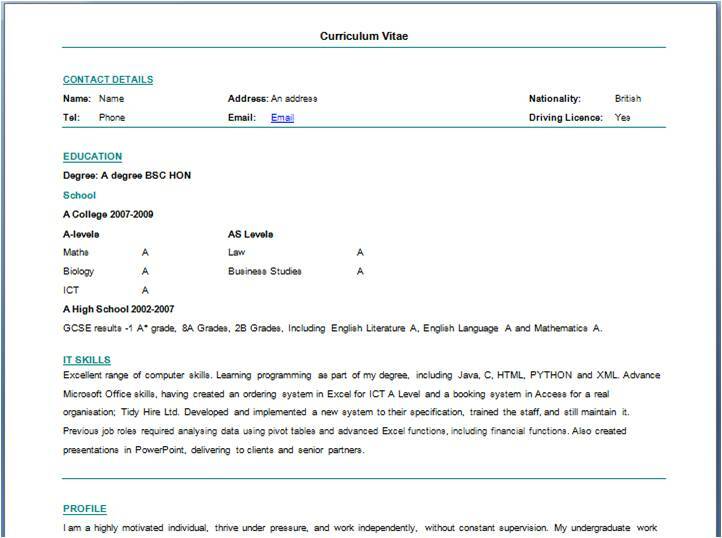 Curriculum Vitae- It’s silly, but like I said it’s usually the silly things that count. Don’t be CV, its slang and looks unprofessional. The key to a CV is professionalism, so start as you mean to go on. When writing your education, start with your most recent, such as degree, and then move down. Make sure you display the details in an easy to read format. For example, display A- levels in one column and AS levels in a column next to it. With thousands of CVs to look through, you want HR to be able to quickly spot your achievements. A top tip, a recruiter gave me after an interview. If you have enough good, strong qualifications to meet the requirements, leave off any extras that are below standard. It’s human nature to pick up on the bad, which will over shadow your excellent features. So for example if you have 3 A-C grades at A-Level, but did a 4th and got an E, leave it off. This is something that a lot of people don’t add, but I cannot stress it enough, how important it is. It doesn’t matter if you’re not applying for a technology role, you are going to be using a computer, and I can promise you that. Even my dad, who is a workman, still has to use a computer to book timesheets and log reports. Employers want to see that you have key skills such as Excel, PowerPoint and Word, at a proficient level. This means knowing in Excel what If Statements are, Pivot Tables, and other formulas for example. If you don’t, it’s really easy to learn. There’s a whole raft of material online, and I promise you, it’s really not that hard, but for some reason a skill lacking. At work last year, knowing Pivot tables saved my bacon, and made me life so much easier- you’ll thank me later too! This is essentially a summary of you. It’s your time to say what you are passionate about, and what ‘soft skills’ you have. Who and what role are you applying for? What competencies do they want? So this means that if you are applying for a management consultancy role, you need to say you are passionate about this. State that you are motivated by strategy, efficiency and client engagement for example. The competencies are values the company are looking for in a employee- they will highlight them on their website. If it says they want commercially aware, flexible, leaders, you have to put that you have those skills. Recruiters will have these skills as a checklist, so you need to be able to give them something to check off. If you don’t that empty checklist is going in the bin... along with your CV I’m afraid. We have come to the first part where many people fall down. It’s all well and good saying, I have excellent IT skills, but how does a recruiter know? You need to give examples. It is essential. So for example, say that you created a trend analysis system at work/ at school/ spare time using Pivot tables, so prove it- just don’t lie. I’ve been quizzed in interviews before. Right, well that’s the first part complete. I hope you found that helpful. I’ll give you some time to go over your CV, and then I’ll do part 2 tomorrow. Don’t worry if your struggling to get a job at the moment, it is hard, but there are the opportunities out there. Promise. Just don’t let it get you down, it will be OK, job hunting is a marathon, not a sprint, as my dad told me. Thanks for sharing some sample of C.V. A curriculum vitae is something that almost every working individual has had to create at least once in their lifetime. 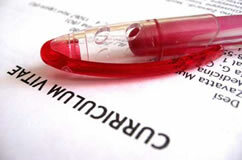 With our cv help you can sit back and relax as we do all of the writing for you.